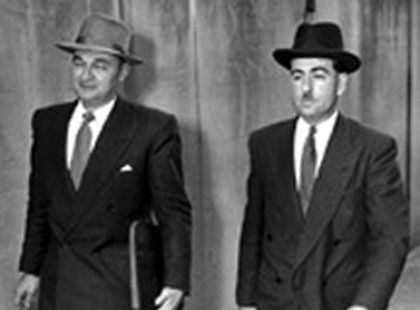 ASIO Deputy-Director Ron Richards (left) with ASIO Director-General Colonel Charles Spry. Photographer – Ern McQuillan. Image courtesy of the Mitchell Library. State Library of New South Wales. An illustrated timeline of the events surrounding the Petrov defection, including short biographies of the key players. The following audio files represent a mix of contemporary recordings and selections from the Petrov Exhibition media launch, held in April 2004 at Old Parliament House. — ALP leader Dr H V Evatt, puts the case for conspiracy and invokes Molotov. Courtesy of the National Archives of Australia. — Prime Minister Menzies rebuts Dr Evatt’s argument. Courtesy of the National Archives of Australia. — Airline stewardess Joyce Bull describes Mrs Petrov’s journey from Mascot, in the air, and at Darwin Airport. Old Parliament House collection. — Journalist Bernard Freedman describes Document H and his scoop at the Russian Embassy. Old Parliament House collection. — Michael Thwaites recalls his recruitment into ASIO and his subsequent relationship with the Petrovs. Old Parliament House collection. — Professor Robert Manne outlines the Petrov Affair. Old Parliament House collection.